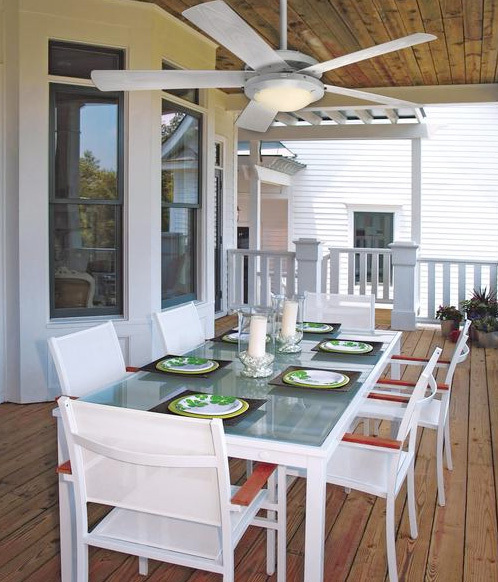 Placing a ceiling fan in an outdoor space like a gazebo or patio can be a great choice for those hot summer nights. But unlike indoor ceiling fans, there are are few extra things you should consider before purchasing one such as it’s general placement, outdoor conditions and corresponding UL rating. Adding a ceiling fan to an outdoor space is the perfect touch to a more comfortable outdoor experience. UL (Underwriters Laboratories) fan ratings are used when determining whether you are purchasing a ceiling fan that is suited for indoor or outdoor use. All fans should have a UL rating and they come in three different flavors: Dry Rated, Damp Rated and Wet Rated. For outdoor use you will need to look for either a Damp Rated or Dry Rated fan depending on the outdoor space. Dry rated ceiling fans are meant for indoor use only. Wet and damp conditions may destroy the motor, blades and other elements if used outside. If you need a ceiling fan for outdoor use opt in for a damp or wet rated ceiling fan instead. Damp rated ceiling fans are ideal for covered outdoor areas that will not have direct contact with rain or other weather conditions. These fans can handle moisture from the outdoor air without damaging the fan. The materials of these fans usually prevent rusting, warping of the blades and damage to the motor if exposed to prolonged humidity. Wet rated ceiling fans are best for outdoor spaces that will have direct contact to rain, snow or high humidity. Like damp rated fans, wet rated ceiling fans are made of special materials to prevent damage once exposed to moisture and wetness. The motors on these fans are usually encased in a water resistant seal to avoid internal damage to the electronics inside. Can you use an outdoor ceiling fan inside? Yes! Although outdoor ceiling fans are mostly purchased for outdoor conditions you can also use them indoors. In fact, those living near the ocean or in very humid and damp climates should look into purchasing a Damp Rated ceiling fan for indoor use. Other scenarios to consider using an outdoor ceiling fan indoors includes indoor spaces like laundry rooms, bathrooms or kitchens where moisture is common. Damp rated fans are ideal for blocking moisture and preventing rust and will last a lot longer (and save you money over time) in high moisture environments.